Hahnenkamm Race, High Society, Luxury – this is what first comes to your mind when you think of Kitzbühel. But the city has a lot more to offer. Kitzbühel stands for unique mountain experiences combined with many extras that can only be found in this area: a great skiing area in winter, a true hiker’s paradise in summer and a hotspot for golfers. 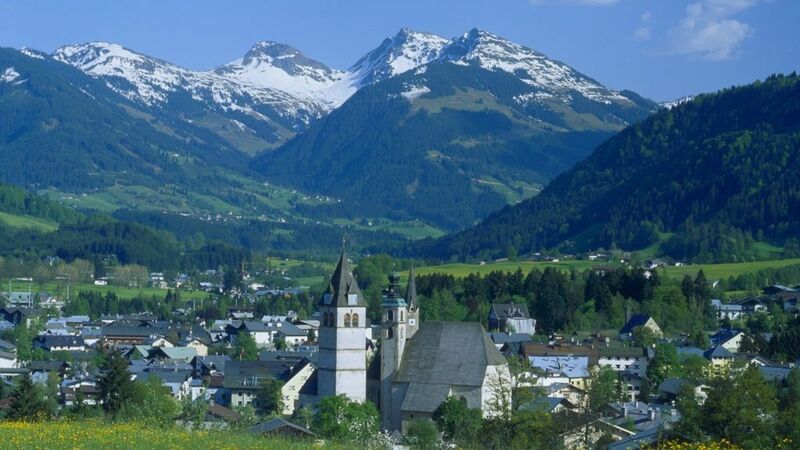 And there is also the charming old town of Kitzbühel with its special flair, many shops and exclusive restaurants. It is also the venue of numerous events such as the international Hahnenkamm Race which attracts numerous VIPs every year. Holidays in Kitzbühel – in the legendary Sport City of the Alps – are always special. The mountain summer in Kitzbühel is as fascinating as the winter season. The city is flanked by the Kitzbüheler Horn and the Steinbergkogel peak. This picture-perfect scenery has a lot to offer for your summer holidays: 500 km of hiking trails and 750 km of mountain bike routes. Lake Schwarzsee is located just outside the city and presents itself in contrast to the mountains. This idyllic place is perfect for those who want to take a swim and relax. One highlight is that the Wilder Kaiser mountains are reflected in the water. There is also a golf club nearby, one out of four golf courses in Kitzbühel. Kitzbühel has always been one of the most popular destinations for skiing holidays. Skiing was and still is a central element for the city’s identity. Since 1892, when the skiing pioneer Franz Reisch skied down the “horn” for the first time, this sport has found a home and it is impossible to image Kitzbühel without skiing. Nowadays, the skiing area Kitzbühel – Kirchberg – Pass Thurn offers 170 km of slopes between Hahnenkamm and Restehöhe peak. And right at the entrance of the city, you will find the “Streif” – the internationally known race track in Kitzbühel. You have to go down this special slope at least once during your holiday in Kitzbühel. Off the slopes, winter in Kitzbühel can also be very quiet. Take your time and discover the white landscape – therefore, the mountains in Kitzbühel offer perfect conditions. Ski touring is e.g. possible in the Bichlalm ski touring area where you will find true powder snow pleasures. Cross-country skiers await romantic tracks around Lake Schwarzsee. The tracks are floodlit and provided with artificial snow. Kitzbühel between Hahenkamm race, snow polo, triathlon and tennis trophy. The city's heart is beating loud and strong. Kitzbühel, the Alps' sports capital, offers a charming mix of old traditions and modern lifestyle in a typical Tirolean setting. The city is famous all over the world not only for its top-notch sport events but also for its unique charme and upscale hotels and restaurants. Real estate in magnificent surroundings; timeless, elegant jewelry and the latest fashion trends. Kitzbühel offers it all! The latest fashion, top real estate and luxurious jewelry. Are you looking for a special souvenir, do you want to buy new clothes, surprise your beloved ones or settle down in Kitzbühel? Not only does Kitzbühel host a number of top international events every year, but it is also home to attractive leisure facilities and exclusive shops. Kitzbühel, your "Home-Away-From-Home" welcomes its Winter Guests from all over the World. Getting to know the country and its people is easy here. According to a popular saying "the ice is broken before you even see the snow". This openness towards strangers can be attributed to over 100 years of experience in tourism, thanks to which guests have become a customary part of everyday life. On the other hand it´s always easy to make friends with people who share the same interests: the beauty of Nature, and the wide range of sports and leisure facilities to enjoy it. When guest call Kitzbühel their second home then this is a great honor for us. An honor, for which we would like to thank you. All international fast trains stop in Kitzbühel. The station is about a 10 to 15 minutes' walk from the center of town. Taxis are available in front of the station. Public buses also leave for the center.